The Favorites is a series briefly exploring films I love, to find out what makes them - and me - tick. Citizen Kane (1941/USA/dir. Orson Welles) appeared at #11 on my original list. ...This is a "favorites" list, not purely a "greatest." Every film that makes the cut does so for personal reasons. Citizen Kane has always clicked with me on an instinctive level, beyond its intimidating reputation (I'm glad I saw it when I was around ten rather than twenty, young enough not to bring too many expectations). Many of the reasons for that connection should be apparent to anyone who's read a few of the other entries in this series. First, I've repeatedly demonstrated affection for films that depict transformations of individuals over time, especially when done against a historical backdrop. I don't think I need to explain any further how that applies to Kane. Second, I am drawn to works that can contain both the "Melies" and "Lumiere" schools of presentation, cinema's magic-trick and documentary tendencies side-by-side. 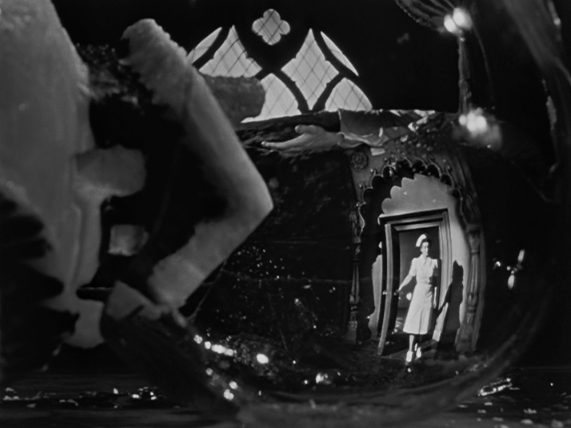 Kane is full of the manipulation that Welles, a bona fide magician, prided himself in: it's chock-full of make-believe (Roger Ebert has observed that the film contains as many special effects as fantastical blockbusters released decades later). But it has also been celebrated for its observational, quasi-documentary qualities, using depth to take in the totality of an environment and the subtle shifts in a performance; Andre Bazin even cites Welles as a forerunner to Italian Neorealism. Third, on a related note, Kane mixes all sorts of genres, tones, and styles - in telling a life it doesn't just build one world, it inhabits many, from newspaper comedy to political intrigue to gothic melodrama. And its love for anecdotes and small gestures makes it a kind of collage of moments, some seemingly barely related to the whole. Fourth, I certainly have my auteurist streak and Kane is the shining beacon of auteurism, both in the conventional, borderline-mistaken sense - Welles had complete control of a production, the way few have before or sense - but also in the deeper, more accurate sense of a creative mind interacting with worldly material and other collaborators, allowing us to see the human spark within an industrial product. This is all the more evident when you explore Welles' other work, eccentric, unique, homemade in the extreme, and see how much of himself he brought to Kane. Finally - and despite this list's preponderance of morbidity I do like to laugh I swear! (to be fair, Kane, while no comedy, has a lot of humor) - Kane is a grand tragedy, beginning and ending on a somber note and imbuing even the moments of fun and whimsy with a sense of bigger purpose. Pauline Kael adored the film, even if she was unfair to Welles in her praise of it, but she also fostered the idea that it's only winking at us with its grandiloquent gestures and psychoanalytic mumbojumbo. But Kane is sincerely interested in this man, the people who surrounded him, and the larger world he was a part of. It fuses dangerous ambition and confident experimentation in a fashion I find irresistable, succeeding in art where Kane himself failed in life. More from me • This was supposed to be the year of Citizen Kane for me...and with any luck it still will be. This spring, for the 75th anniversary, I launched my most ambitious video series since Journey Through Twin Peaks. Unfortunately, due to both blogging and real-life distractions, it remains unfinished past the preview and introductory chapter. Hopefully I'll be able to resume and even conclude it by the end of the year, so keep your eye on this site. Meanwhile, I've featured the film several times in other capacities. Focusing on how each "narrator" of Kane's story inflects its style and content, I wrote a lengthy review for my "Big Ones" series (this was probably my favorite entry, and its analysis forms much of the basis for the upcoming videos). I also shared Francois Truffaut's wonderful essay on the film, and a clip from Kane is featured at 3:14 in "Storm Clouds Gather", a chapter in my video clip series "32 Days of Movies" (while a shot appears in my 7 Rooms guide montage). What do you think? • Is Citizen Kane the greatest film of all time? Is it even Orson Welles' masterpiece? What other Welles films are your favorites, and do you like them for similar or different reasons to Kane?